To give some perspective, I recently added a 750GB SSD to my SATA-connected mid-2009 17″ MacBook Pro. The Disk Speed Test result was 206 MB/s write and 265 MB/s read. This new faster PCIe connection method is the same as the one advertised for the Mac Pro coming in December. Does that mean the new MacBook Pro can edit 4K video smoothly? It will do if the GPU is fast enough. I decided to test to see if my new Mac can edit 4K well. I don’t have a 4K monitor or a UHD TV (which can be connected to the new MacBook Pro using the HDMI connector), so I simulated a 3840 by 2400 display using QuickRes – a shareware app from thnkdev. 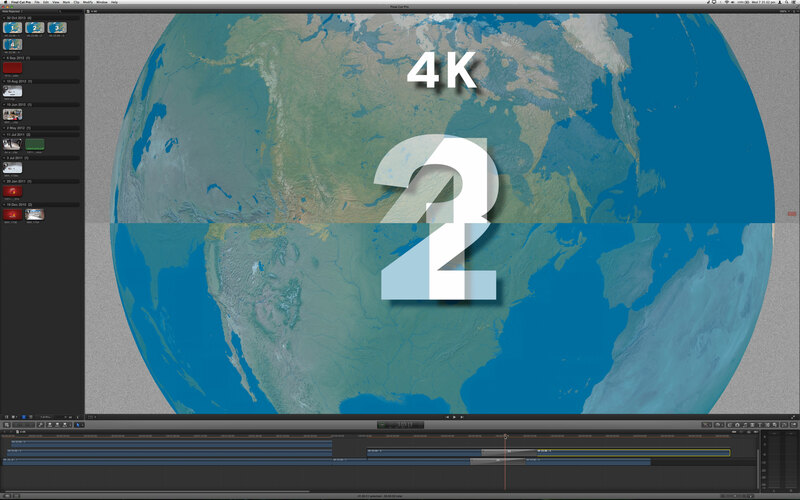 As far as Final Cut Pro X was concerned, a bigger than 4K screen was attached. I generated 4 two minute 23.98 frames pet second 4K clips which I encoded as ProRes QuickTime movies – 7 GB each. The rotating globe helps to see how smooth playback is. Behind the globe is randomly generated noise which is harder to decode from the source files. I imported them into Final Cut Pro X without creating proxies or making optimized versions. I turned off background rendering. Click the cog (to the left of the YouTube logo) and choose the 1080p version from the pop-up menu. What the storage you used? gpu ? nvidia 750 ? I went for the discrete GeFore GT 750M 2GB GPU option. I’m in the habit of keeping (what we now call) Project and Event files on external storage. I wonder how all this would work using external SSD storage for those event and project files? I have the GT 750M option as well. We know that the base Iris configuration can only drive 4K displays at 24 or 30 Hz (depending on the exact display size). Can you tell how fast the 750M can drive a 4K display? The frequency limit applies to our machines too. Not because of a GPU limitation, but because HDMI 1.4 doesn’t have the bandwidth. Someone needs to connect a new MacBook Pro to a 4K display via a DisplayPort connector. I read last Brandon Leake comment and I’m confused. He wrote that the 1 TB is much faster than the 512 GB but how is possible? Both have the same interface and i don’t think that the 1 TB is 2×512 gb in Raid. So Alex can you give me some info about 1 TB ssd under “This Mac info—–More info” section of your macbook pro? With this product number, or model number i can search technical details before buy macbook. Thanks in advance and sorry for my english. (I’m italian). This article nails my decision to update my MacBook Pro to the late 2013 one. At the moment I own a MBP Retina mid 2012 with only 8GB of RAM and the NVIDIA 650. What all do I need with the MacBook Pro 15 to edit 4K Video.